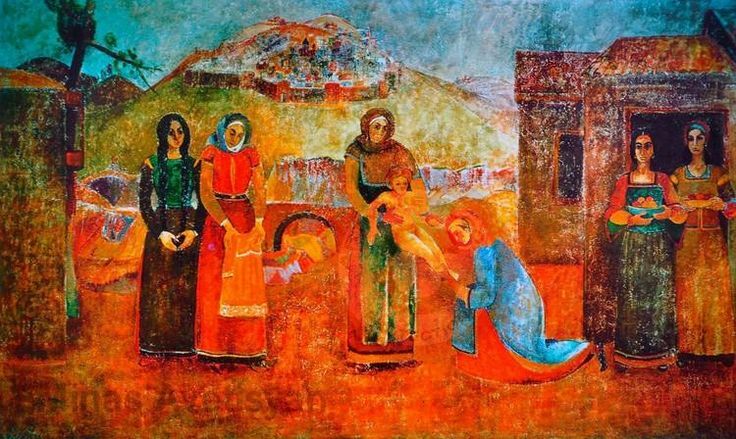 Minas Avetisian was one of the most important figures of Armenian painting in the second half of the twentieth century. Minas (he is frequently named by his first name alone) was born on July 20, 1928, in the village of Jajur, near Leninakan (nowadays Gumri), in the family of a blacksmith. During the World War II years, he met by chance a local painter, Hakob Ananikian (1919-1977). This encounter became fateful for the future artist. In 1947 he entered the Panos Terlemezian Art School in Yerevan. Upon graduation, in 1952 he went to the Institute of Art and Theater, but a year later he moved to Leningrad (nowadays St. Petersburg), where he studied for the next seven years at the Ilya Rebin Institute of Painting, Sculpture, and Architecture (the former Art Academy of St. Petersburg). In 1960 he returned to Yerevan. He entered the art world in his early thirties, relatively late, but his brief and intense career would turn him into a symbol of Armenian modernist art. He would come to produce some five hundred small and big paintings during the next fifteen years, characterized by their strong chromatic contrasts, with lyrical and sometimes tragic expression. His childhood impressions from life in the village became one of the most powerful creative sources for him. His production included landscapes, portraits, still lifes, and frescoes. He was also the illustrator for several ballets and theatrical works, such as Aram Khachatourian’s “Gayaneh” ballet and Alexander Spendiarian’s “Almast” opera, and the movie “This green, red world,” directed by Yuri Yerzinkian and Ernest Martirosian (1975). His art was especially influenced by Armenian miniature painting and the art of the Italian Renaissance. His first individual exhibition, in 1960, was met with skepticism. The painter had already shown an unusual artistic thinking. His true value emerged in the “Exhibition of Five” in 1962, along painters Lavinia Bazhbeuk-Melikian, Alexander Grigoryan, Arpenik Ghapantsian, and Henrik Siravian. He was admitted to the Union of Painters of the USSR in the same year. In 1964 Minas married fellow painter Gayane Mamajanian. They had two children, Arman (1966) and Narek (1969), also a painter. Four years later, he was honored with the title of Emeritus Painter of the Armenian SSR. Also in 1968 he appeared in Mikayel Vardanov’s film The Color of the Armenian Land. Between 1970 and 1974, Minas produced 20 frescoes in Yerevan, Gumri, and the surrounding villages of Azatan and Vahramaberd. Some of them were seriously damaged after the earthquake of December 7, 1988. The buildings that harbored them were destroyed or left in precarious situation. However, the collaboration of experts from Bulgaria and Italy over the past three decades helped restore some of the frescoes and save them. Some of them were moved to Gumri and Yerevan. The acclaimed fresco “Toros Roslin’s Birth” was moved from Gumri to Minas’ museum in his hometown Jajur. Two other frescoes were restored and moved from Gumri to the Government House in Yerevan. A catastrophic fire in the painter’s atelier, on the night of January 1-2, 1972, caused the loss of all the works collected there, including those to be showcased at an individual exhibition in Paris (some 300 works, including 120 paintings), and his personal archive (letters, etcetera). On February 16, 1975, Minas Avetisian was struck by a taxi driver in Yerevan, and passed away on February 24. The circumstances of his death have remained unclear to the present. Both the fire of 1972 and the death of the artist are said to have been the handiwork of the KGB, the Soviet secret police, but this remains a conjecture. He was a popular name, and also an art dissident, since his style was far removed from the official orthodoxy of Socialist Realism. Minas was posthumously awarded the State Prize of Armenia (1975) and the Martiros Sarian Prize (1980). 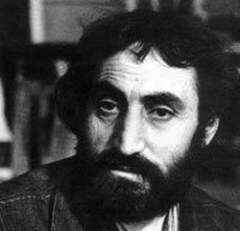 Two films were also dedicated to him: Minas Avetisian (Marat Varjapetian, 1975) and Minas: Requiem (Mikayel Vardanov, 1989). Two museums dedicated to his work were posthumously opened in Yerevan (1977) and Jajur (1982). The latter was destroyed in the earthquake of 1988 and reopened in 2005.